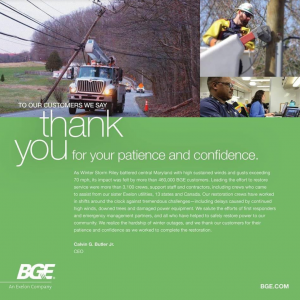 BALTIMORE (March 9, 2018) – BGE has restored electric service to all customers affected by Winter Storms Riley and Quinn. Approximately 462,000 BGE customers were affected by the two destructive nor’easters, which inflicted heavy damage from the Mid-Atlantic to New England beginning last Friday. Strengthening significantly beyond forecasts, Winter Storm Riley delivered high sustained winds and gusts through the 70-mph-range for more than 48 hours. The vast majority of BGE customers impacted by Winter Storm Riley were restored by Sunday night, and crews continued to work around-the-clock shifts to restore service to all customers. Repairs to the massive and widespread damage to the electric system were further complicated by additional damage caused by Winter Storm Quinn on Tuesday and Wednesday, which brought heavy, wet snow to some portions of BGE’s service area. Now that BGE has addressed all outages associated with both storms and has sufficient resources to safely and quickly address any outages should they occur on BGE’s system, external crews have been released to assist our Exelon sister utilities to the north. They experienced significant damage to their electric systems and additional outages from Winter Storm Quinn. Crews from BGE’s Exelon sister utility ComEd in Illinois, as well as from utilities in Alabama, Arkansas, Florida, Georgia, Illinois, Louisiana, Michigan, North Carolina, Ohio, Oklahoma, Pennsylvania, Texas and Canada have assisted in BGE’s restoration effort. Resources operated out of regional staging areas at Ripken Stadium in Aberdeen, M&T Bank Stadium in Baltimore and BWI Airport in Anne Arundel County. provider. Like us on Facebook and follow us on Twitter, YouTube and Flickr.